This site is out of Business. This website is created for members at Linguarama Stratford-upon-Avon (18th February 2008 - 22nd February 2008). THIS SITE IS OUT OF BUSINESS! 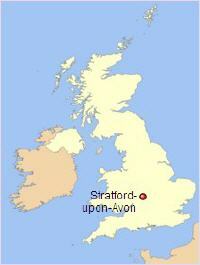 Stratford has Anglo-Saxon origins, and grew up as a market in medieval times. The name is a fusion of the Old English strǣt, meaning "street", and ford, meaning "ford". Stratford is also close to the Cotswolds, with Chipping Campden some 24 km (15 miles) to the south. As a major sheep producing area (Shakespeare's father, John, bought and sold sheep illegally for a while) the Cotswolds, up until the latter part of the 19th century, regarded Stratford as one of its main centres for the slaughter, marketing and distribution of sheep and wool. 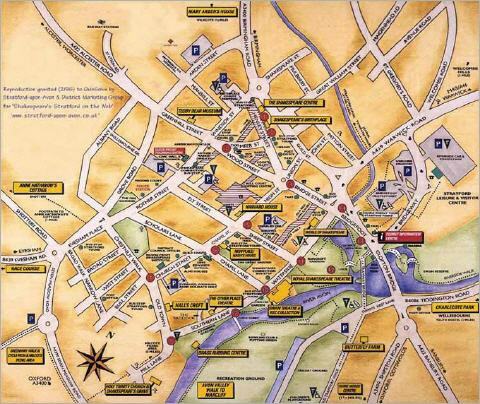 As a consequence Stratford also became a centre for tanning during the 15th - 17th centuries.